Normal operation of the cooling system. "The cooling system employed is the by-pass type, allowing coolant to circulate around the engine while the thermostat is closed. This prevents temperature build up in the cylinder head prior to the thermostat opening. "The positioning of the thermostat in the inlet, rather than the outlet side of the system provides a more stable control of the coolant temperature in the engine. "When cold, the thermostat closes off the coolant feed from the radiator outlet. Coolant is able to circulate through the bypass and heater circuits, returning back to the engine via the thermostat bulb. "As temperature increases the thermostat gradually opens, bleeding cool fluid into the cylinder block and allowing hot coolant to flow into the radiator, balancing the flow of hot and cold fluid to maintain temperature. As the thermostat opens further, so the full flow of coolant passes through the radiator. "Any excess of coolant created by heat expansion is returned to the expansion tank via the bleed line. A jiggle valve fitted at the start of the bleed line, prevents pressure build-up in the expansion tank by regulating the amount of returning coolant. "The coolant circulating pump is a rotor type drawing coolant directly from the thermostat, the pump is driven by a geared pulley from the camshaft timing belt. 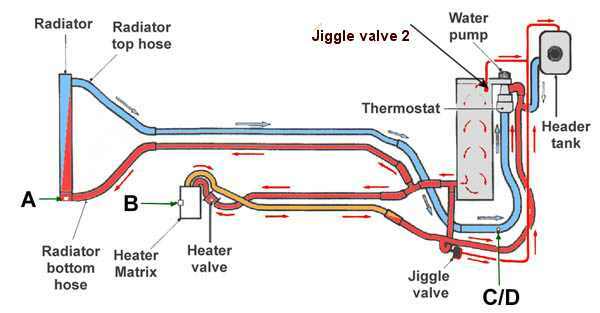 Location of Jiggle Valve #2, as shown in figure, right. Image courtesy of Dieter Könnecke. "The radiator positioned at the front of the vehicle, is a copper/brass cross - flow type with moulded plastic end tanks. The radiator is mounted in rubber bushes; the bottom of the radiator is located in the front body member, and the top is located in the bonnet locking platform. The hoses connecting the radiator to the engine run underneath the vehicle. Three bleed points are provided for bleeding the system. "For additional air flow through the radiator matrix, usually operational when the vehicle is stationary, an electric cooling fan is fitted to the rear of the radiator. The temperature of the cooling system is monitored by the ECM [MEMS electronic control module] via signals from an engine coolant temperature sensor mounted in the cylinder block outlet elbow. When a temperature of 102C is reached, the ECM switches the fan on via a relay. The fan switches off at 96C."